A line of questioning during Christine Blasey Ford’s testimony before the Senate Judiciary Committee managed to articulate, quite clearly, what prosecutor Rachel Mitchell was enlisted by the committee’s Republican majority: make Ford look unreliable under the guise of neutral questioning. The exchange was about flying. More significantly, it was whether or not Ford is honest. MITCHELL: Okay, I ask that because it’s been reported by the press that you would not submit to an interview with the Committe because of your fear of flying. Is that true? FORD: Well, I was willing—I was hoping they would come to me. But then I realized that was an unrealistic request. FORD: [Laughs] Yes, so, that was certainly what I was hoping, was to avoid having to get on an airplane. But I was eventually able to get up the gumption with the help of some friends and get on the plane. MITCHELL: When you were here in the mid-Atlantic area back in August—end of July, August—how did you get here? FORD: Also by airplane. I come here once a year during the summer to visit my family. I’m sorry, not here. I go to Delaware. MITCHELL: Okay. In fact, you fly fairly frequently for your hobbies, and you’ve had to fly for your work. Is that true? MITCHELL: You were a consulting biostatistician in Sydney, Australia. Is that right? FORD: I’ve never been to Australia, but the company that I worked for is based in Australia, and they have an office in San Francisco, California. I don’t think I’ll make it to Australia. MITCHELL: It is long. I also saw on your CV that you list the following interests of surf, travel, and you in parentheses put Hawaii, Costa Rica, the South Pacific Islands, and French Polynesia. Have you been to all of those places? FORD: It’s easier for me to travel going in that direction when it’s a vacation. This is what Mitchell was brought to Washington to do. The Maricopa County prosecutor is there to do the bidding of the 11 Republican men who handpicked her to speak for them. 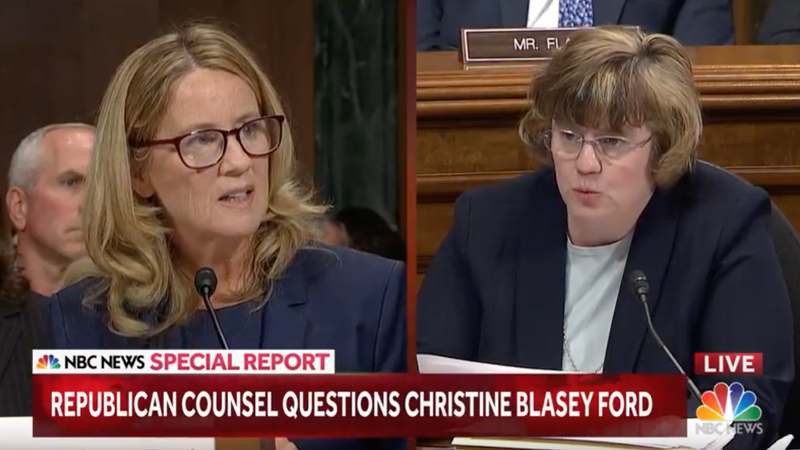 Her questions throughout the hearing have focused on minute details—timelines, chains of events, over and over again— in what seems like a transparent attempt to trip up Ford’s steady testimony. It’s blatant. It’s insulting. It’s not working.